MONTREAL — Brian Gionta thought he had a sure goal near the end of the second period Thursday night, the Montreal Canadiens captain on the doorstep for a tap-in, only to be robbed by Craig Anderson. 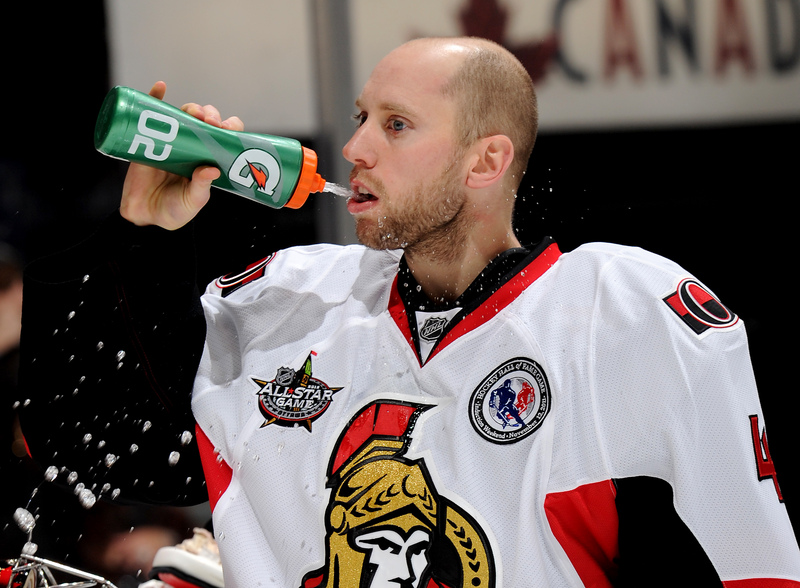 The Ottawa Senators netminder did a lot of that last season, especially in a first-round series win over the Habs. In one of Bryan Murray’s most brilliant moves as general manager of the Senators, he acquired Anderson from Colorado in February 2011 in exchange for Brian Elliott. While Elliott has gone on to have some measure of success in St. Louis as a 1B to Jaroslav Halak, Anderson has been Vezina-like in Canada’s capital. 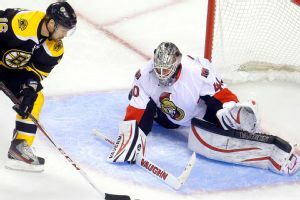 AP Photo/Steven Senne Robin Lehner played 12 games for the Senators last season, posting a 2.20 goals-against average and .936 save percentage. It was a franchise-altering move. Ah yes, Robin Lehner, the 22-year-old netminder finally breaking camp with the NHL squad after three years of tutelage in the AHL. There are some around the NHL that think Lehner is already starter material. Some also believe he’s franchise-goalie material in the not-too-distant future. All of which makes Ottawa’s netminding duo arguably the most potent in the NHL. Anderson, for one, might have won the Vezina last season had it not been for an injury that made him miss too much time to garner enough votes from NHL GMs. When he was healthy, he put up a ridiculous .941 save percentage along with a 1.69 goals-against average. Anderson aims to pick up where he left off. While most NHL teams have to live with the fact that on 20 to 25 nights a season, they’re giving a goal away by dressing the backup, one could argue the Senators will have a true starter in net for 82 games this season. Going back to the franchise re-birth in 1992, the Senators have always lacked that true, surefire elite No. 1; it cost them in their playoff series losses to rival Toronto, and you could argue it is the reason that a Stanley Cup eluded the club in the late 1990s and 2000s despite all the incredible talent that skated in suburban Kanata. It was awfully important to Murray when he took over the reins as GM to fix that. Anderson starts as the No. 1 guy, but those around the organization are intrigued to see how Lehner pushes Anderson. My sense is head coach Paul MacLean will ride Anderson early and often and make Lehner force his hand as the season goes on. Is Lehner ready for the opportunity? “He’s had a great camp,” Murray said of Lehner, drafted 46th overall in 2009. “He looks like he’s taken another step. Those who aren’t sold on Lehner wonder whether he has the temperament to be an NHL star goalie. Lehner says his time in the AHL helped his development immeasurably. What will be new for Lehner is beginning the year as a backup. But he welcomes the chance to maximize his opportunities. Not every netminder loves being “pushed” in net by his tandem mate. Some goalies are peculiar lads, indeed. But Anderson, a likable veteran who has traveled a tough road to gain his well-earned respect around the league, says he’s fine with it. Anderson was referring to 2006 when he was waived three times from January to February, going from Chicago to Boston to St. Louis back to Chicago, trading hands like a bag of popcorn. An obvious strength in Ottawa this season will also be fascinating to watch, as the kid pushes the vet. It’s a situation the Senators have dreamed of for a very long time.